Plangarden and Gimp are handy tools for moving things around in the garden without too much back ache. This is a preliminary map for the Spring 2010 Garden – not the veggies yet, but at least the structures. 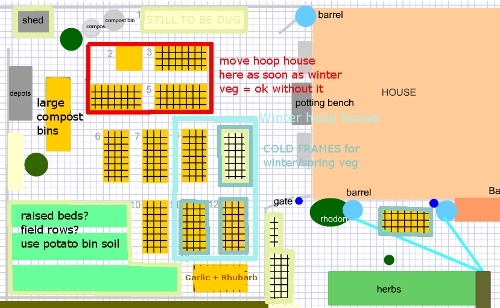 The hoop house will be moved from its present position (light blue) over beds 8, 9 (still to be dug), 11 and 12 as soon as the cold weather veggies in those beds can do without it. If need be I’ll put cold frames over those beds. The hoop house will move over beds 2, 3, 4 and 5, destined for hot house tomatoes, peppers and eggplants, so the soil there can start warming up early. I framed in pale green those beds that still need to be dug. I am still debating on whether to create raised beds or field rows in the south-western part of the garden (bright green). I will use the soil from last year’s potato towers there – these beds will hold lettuce and shade crops, so no fear of blight. The old potato towers will become a large compost system. I’m not sure if the north-west corner will become home to a small shed yet. It might be a good place for either the chicken coop (opening into the fenced off garden to the north, not to the veg garden, of course) or the beehive (would that be too close to human activity?). The bright blue circles indicate rain barrels. The two barrels up front will overflow into pipes (blue lines) leading down to a brook/wetland that will drain into a fish pond at the bottom of the front garden. i love garden plans. i have to work on ours soon. we only have a rough sketch right now. it is so much fun getting all hopeful for spring! What a great use of your property. 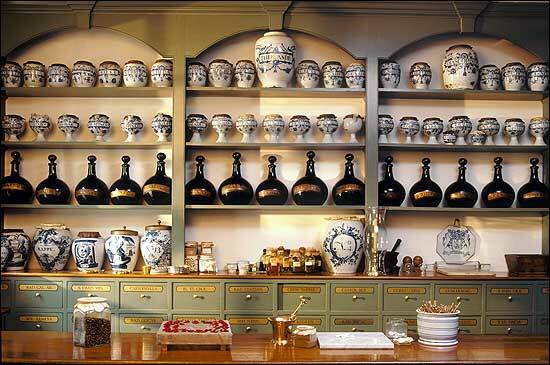 I have The GIMP but hadn’t heard of Plangarden. Where will you put the chickens and the bees?